Volcanoes! Just the name is exciting. 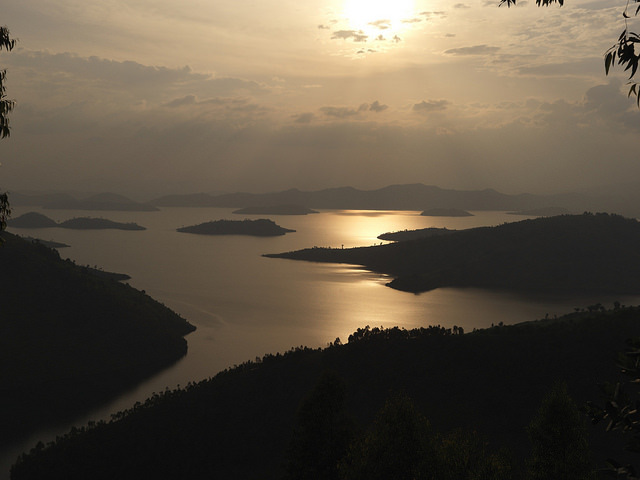 Where you can you combine towering volcanoes, stunning lake scenery and the rare mountain gorilla? 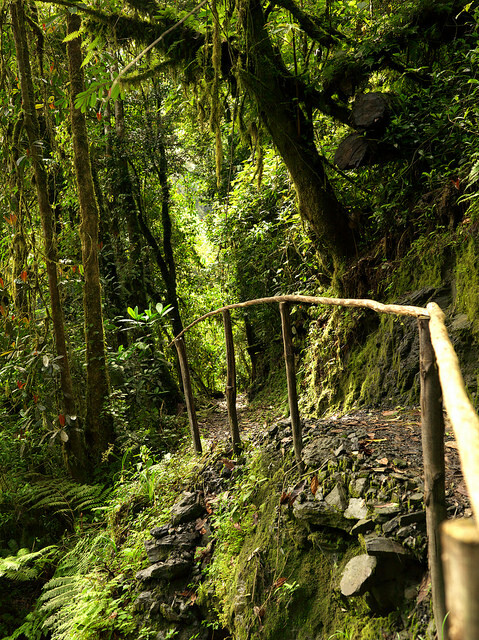 In the Parc National des Volcans otherwise known as Volcanoes National Park! The Volcanoes National Park can be found in the north west of the tiny country of Rwanda and it lies along the neighbouring Virunga National Park which in the Democratic Republic of Congo. It also borders the neighbouring Mgahinga Gorilla National Park in Uganda making this one of the most important areas in Africa for conservation and preservation of the landscape and wildlife. It is also the oldest national park in Africa having been set up in the 1920s in order to preserve the gorillas in this region. As its name suggests this area is volcanic and mountainous and this provides the unique eco-system that is home to some incredible wildlife and some of the most stunning scenery. Volcanoes National Park (VNP) is home to 5 volcanoes which make up part of the chain of Virunga Mountains which in turn make up part of the incredible Rift Valley that runs down the spine of Africa. These volcanoes are Karisimbi, Bisoke, Muhabura, Gahinga and Sabyinyo and they are still partly active. Every now and again there is an eruption making for a spectacular display at night-time! The mountainous slopes are covered in dense vegetation of cloud forest. This makes it a haven for primates of all kinds and also elephants and other wildlife. It is so dense that in some places it is inaccessible which has gone a long way to protecting the wildlife in this region. It also provides food and shelter for these species and continuous high rainfall means the animals never have to move on to look for food elsewhere. The vegetation varies as the altitude increases and some of the highest peaks reach a towering 4000 metres high! In amongst these mountains lie a world of lush greenery and beautiful lakes. Other activities available in the VNP include hiking, mountain biking and boating on the lakes. This region really is one of the most stunningly beautiful in the whole of Africa and will leave you with incredible memories! Dian Fossey made this park her home whilst she studied the mountain gorillas and chimpanzees of this region in the 1960s. She set up the Karisoke Research Centre between Karisimbi and Visoke and is widely recognised as having saved the mountain gorillas from extinction by bringing their plight to the attention of the outside world. There are other species of rare primates in the forests including the Golden Monkey, the Bonobo and the Chimpanzee all of which can be visited by organised trekking groups. Trekking to visit the gorillas or other primates is the main source of tourist income in the area and is also strictly controlled with a limited number of permits available each day so as to not overload the area. There are 8 habituated families in the park and this means there are a limit of 64 permits allowed per day. Treks start early and take several hours of demanding hiking before you reach the group of gorillas you are visiting. You then spend an hour with them before heading back down to the centre where you will be awarded a certificate and have the chance to enjoy a rest and some refreshments. The Kwita Izina is an unmissable experience if you happen to be in the park during June. It is a Rwandan ceremony of giving a name to a newborn baby gorilla. The ceremony’s main goal is to monitor the individual gorilla families in their natural habitat. It was also created as a means of bringing attention both locally and internationally to the importance of protecting the mountain gorillas, their habitats and also to bring in some much needed tourist income to a poor area. Volcanoes National Park and Rwanda as a whole offer so much to the visitor. The friendly welcome of Rwandans is world famous but the scenery is even more impressive. From the terraced slopes of the numerous farms to the soaring peaks of the highest mountains, from the shimmering blue lakes and sandy beaches to the lushest rainforest, there really is something for everyone here. And then there is the incredible wildlife; rare, colourful, noisy and awe-inspiring, that make this place truly magical! If you would like to know more about Rwanda and Uganda then please give Lily a call; she has been gorilla trekking and even came face to face with a silverback! Our intrepid explorer Lily is in Uganda trekking through the rainforest to see the rare Mountain Gorillas. I thought I would start today’s blog post with some information about Mountain Gorillas. Did you know that gorillas share 98% of their genetic composition with humans? I think it is this close connection that makes us humans so fascinated by gorillas. There are currently about 800 mountain gorillas left in Africa of which 480 are in the Virunga Volcanoes region which straddles Uganda, Rwanda and the DRC. Of these 480 gorillas about half live in Bwindi National Park. There are roughly 36 family groups and 14 solitary silverbacks distributed across four different protected areas. However the gorilla watching programmes are quite limited because of the natural movement of these gorilla families. For example the. Mgahinga National Park group of gorillas in Uganda to the south of here often move around and cross over the borders into the DRC and Rwanda. The unstable politics of the DRC mean that their gorilla groups are not always accessible for security reasons. There are currently six habituated family groups in Uganda available for daily viewing. Usually the males are about twice the size of the females and can grow up to 6 ft tall and weigh between 350 – 500 pounds. New born babies weighing about 6lb only so that is a lot of growth! They are exteremly strong, with long arms (stretching to 7 feet) and very muscular. The males are referred to as silverbacks because as they mature the hair on their back turns somewhat silver, hence the name. The strength of the males is ten times stronger compared to the strongest human athlete! The other members of a gorilla family are females, immature males known as ‘blackbacks’, juveniles and youngsters. Mountain Gorillas possess longer plus darker hair compared to their lowland counterparts because they stay in colder climates and higher altitudes. Their life span is thought to be between 25 and 30 years. They mainly live on the ground although occasionally climb trees that can support them – the young gorillas regularly play in trees. Mountain Gorillas are vegetarians and eat large quantities of flowers, leaves, fruit, roots, bamboo and shoots in season. The adults can consume up to 75 pounds each day. Bearing in mind that the gorilla trek costs quite a lot of money I do think it is vital that anyone going on a trek is well prepared and ready to make the most of this once in a lifetime experience! We set off up the wide track with our rear guard armed scout (just in case of forest elephant encounters) and Gad told us that the Bitakura gorilla family had been sighted in the deep valley below but were on the move. I had my small Panasonic camera round my neck and that was all – blissful not having to carry anything! We turned off the track, walking carefully as there were roots which caused one or two ‘trips’ on a steep downhill route through fairly open forest and as we walked I noted some pine trees (despite being almost on the Equator!) and elephant droppings! Underfoot was dry in contrast to the uphill slog which awaited us! Sunlight filtered through the trees and we were all very excited and filled with anticipation of the imminent gorilla sighting… However then word came through by walkie-talkie from the trackers that the gorillas were headed up the other side of the valley, in the opposite direction to us! We reached the valley floor, crossed a stream and boggy area and started the ascent up the other side which plunged us into a different landscape altogether. Tropical rainforest with all its attendant thick undergrowth meant that we had to cute a path through with a machete. We spent a lot of time sweating, panting, crawling and clambering up slippy paths with steep drop offs. The Impenetrable Forest is aptly named – it really is a riot of green where things grow on top of other things in layers of ferns, mosses, creepers and lichens. As the valley side got steeper and steeper my porter came into his own, carrying my rucksack and helping me up with the odd ‘push’ if he noticed my foot slipped even a tiny millimeter! At first, I was a little cross as I wasn’t used to being aided but as time went on and the route became increasingly difficult and we were grabbing any available branches/roots/ferns, his assistance was much appreciated! Sweat dripped into my eyes and mouth and I wondered if we would ever reach the top. I fixed my eyes on a chink of daylight far above through the tall forest trees. As the chink got bigger and brighter, I knew we were heading closer to the top! Then suddenly, almost before we had realised it, we burst out from the forest into an area which was almost montane in first appearance. There were giant ferns and small shrubs and it was at last flat! In fact we were all so relieved to be walking on level ground that it took a few minutes for us to realise that we had company!! As I looked into the vegetation I saw something black and it dawned on me I was looking at my first ever gorilla. It seemed incredibly that we had managed to arrive right on top of the Bitakura gorilla family who were enjoying a jolly good ‘feed’ on the surrounding vegetation. They were very unconcerned at our presence which I was pleased to note and I was happy to feel that we weren’t encroaching on their normal daily routine. Across the track from us was a silverback who gave me a withering look of total disinterest! The Bitakura family consists of 4 silverbacks, 2 blackbacks, 3 females, 1 juvenile and 2 infants. I think that we saw most of the family although it was hard to say as they kept appearing from different directions including three of them who had been up in the trees. One young gorilla gave wonderful child-like display of rolling on the soft forest ground then running off of hide behind a tree… or so it seemed to us. We made very little eye contact as we had been told not to and the gorillas certainly seemed to ignore our presence at all times. We were able to wander around keeping our distance and I actually moved down the track away from the silverbacks whilst filming. Then I had a great moment of luck when the two silverbacks came out of the ferns and loped down the track towards me. I kept on filming walking quickly backwards and suddenly felt myself being steered to one side (by a ranger) as I’d been about to walk into a tree. They told me to keep filming (which I did!) and I got some interesting footage at close range. It was an incredible moment for me and one I will be able to treasure forever. The rangers were very strict that we should not get closer than 3 metres. Although it appeared that some of our group didn’t understand this too well!! It is important to give the gorillas their space or they may take it as a threat when approaching too close. Gad and his team of rangers and porter were very sensitive to our needs and helped us make the most of the experience, showing us where to stand for best views, photos and movie footage. My main surprise about the gorillas particularly the silverbacks is that they aren’t as tall as I was expecting – although this could be something to do with the fact that I recently viewed the Hollywood movie King Kong! It is said that looking into the eyes of a mountain gorilla is a life changing experience but personally I found the whole experience life changing! From the very first moments starting with the drive up into the mountains from Lake Victoria to Bwindi, staying in the idyllic location of Mountain Springs, rising at dawn, the stunning but lumpy drive to the Ruhija area, the meeting with the fantastic rangers and porters and even the obligatory ‘man with the gun’ in case of forest elephant encounters. Not forgetting the tough trek up hill and down dale to eventually come face to face with these very rare primates, a silverback mountain gorilla and his family. The moments that really stand out for me was my silverback filming encounter and thanks to my camera zoom a close up view of a young gorilla carefully scrutinising a leaf with the delicate touch of his four fingers which were so human like. After our allotted hour with the gorillas, we then sat down by the edge of the forest and had a snack and some water before setting off up the track by the edge of the forest. I think we were all very relieved that we didn’t have to return by the same demanding downhill/uphill route. We walked for about 30 minutes along the high track then over cleared land where potatoes and other crops were planted. A Land Rover was waiting to take us back to the Ranger Post with a short 20 minute drive. Back at the headquarters we were given our certificates as proof of having done the trek – these are included as part of the gorilla trek package. We also treated ourselves to some T-shirts “I tracked the Gorillas in Bwindi!” and some carved gorillas too. We finally left this incredible place and headed back to the Buhoma area and Mahogany Springs Lodge. We had a great sighting of 3 black and white colobus monkeys leaping between trees by the roadside as well as the constant stream of locals walking down the road. We arrived back at the lodge by 3pm all tired but euphoric after our gorilla encounter. The lodge was lovely and comfortable and I just wish I had had more time to enjoy relaxing there and even take the scenic walk to the nearby waterfall. However I can’t complain as I had just had one of the most unforgettable days of my life with the Bitakura gorilla family in the Bwindi Impenetrable Forest National Park. Our erstwhile globetrotter Lily has been off on her travels again. This time she is visiting Uganda to go on a gorilla trek. We will be following her travels and her trips for the next few weeks as she explores this beautiful country and meets these amazing animals. We arrived at Mahogany Springs Lodge around 7pm and we were very warmly welcomed by the staff to this very attractive lodge which is set on the side of a valley in lush scenery and magnificent trees. We were given a delicious cold fruit juice and cold damp flannels to wipe the dust away and revive ourselves before our welcome talk given by David. We were told all about the lodge, the rooms, the food and what to expect on the gorilla trek. The rooms here are very attractive large rooms with a spacious en suite bathroom and a balcony/sitting area overlooking the opposite side of the valley. We also had a most welcome and tasty supper. I was able to send a blog post from my room as Wifi is available with a fast connection which seemed amazing in such a remote location! Let me give you some background to the Bwindi Impenetrable Forest National Park. It is very aptly described as a vast, misty, mountainous jungle and one of the most biologically diverse places in the world. The park lies along the Uganda-DRC (Democratic Republic of Congo) border in the Kabale and Rukungiri districts which are in south western Uganda, on the edge of the Western Rift Valley. Covering an area of 321 square kilometres, Bwindi is a tiny island of equatorial primeval rainforest, surrounded by a sea of banana and tea plantations. It was first protected by changing its status to a forest reserve in 1932, and it finally reached National Park status in 1991. The forest has had a number of names in the past including Bwindi and Kayonza. In the local language Bwindi means ‘place of darkness’ and the name refers to the region’s thick vegetation which is also reflected in the park name of Impenetrable Forest. What is most striking is the steepness of the valley sides and even the huge trees in the forest seem completely dwarfed with the valley sides. Although it can be difficult to spot much wildlife through the mass of huge trees festooned with vines and creepers, the forest is home to over 120 species of mammals, 360 species of birds, 310 types of butterflies and 1,000 different plants. It is suggested that if one suffers from noise irritation, then a pair of ear plugs is handy for the gorilla trek as the rainforest can be spectacularly noisy! We had been divided into two groups for the gorilla trek and Joseph, the manager, gave us a talk about what to do, what to wear and what to expect from the experience. Myself, Heinz, Ewa and Yolanda were to be part of the group visiting the BITAKURA habituated gorilla group in the high altitude Ruhija area, south east of the park with poor transport links. This was mainly because our permits had been applied for only very recently (just over a week ago) which means that the closer, more accessible gorilla family groups already had their full quota of visitors. This is important to note when arranging visits for clients and the sooner the permits are applied for, the more likely it is that the clients will be able to get permits for gorilla groups within a more accessible area. Usually only 8 permits issued per day for each family group and the Buhoma area has most family groups and most tourist accommodation. The Dian Fossey project (of Gorillas in the Mist fame) was the original source of gorilla trekking as she was the first human to make close and friendly contact with gorilla groups. The scientists at her establishment continued this as they studied the groups and gradually more and more people wanted to join in. This then led to small groups only with permits being allowed to visit the gorillas who were habituated in their natural setting. Now it is possible that visitors can get to observe the family groups from only a few metres away. It is to be noted that the development of gorilla tourism is proceeding with great caution in order to avert dangers of the gorillas catching human diseases. No one with a communicable disease (e.g. flu/diarrhoea) is allowed to enter the National Park or take the trek to encounter the gorillas. Although some argue that it is detrimental and risky to the gorillas the sad truth is that without tourism like this the gorillas probably wouldn’t have survived this long. The one thing that can guarantee their survival by making them worth more alive than dead – to both governments and local people alike. We all wake up at 4.45am and eat breakfast at 5.15am. We are then given our packed lunch boxes and some stout walking sticks before leaving the lodge with Joseph, the Manager, in a 4 x 4 vehicle around 6am. We then picked up another couple from Buhoma Lodge nearby and set off on the 2hour 15 minute journey (50 kilometres) to the Ruhija sector. These rural roads are pretty rough and we bounce along as we climb ever higher into the mountains. To make up for this the scenery is truly spectacular with heavily wooded deep valley sides and impressive views. Here even banana plantations are 2000 metres above sea level. The Ugandan people really do make the most of every piece of land, cultivating and growing crops wherever possible. There are only a few tourist accommodations in this far flung area with only the Bitakura family group of gorillas to visit. We finally arrived at the entrance headquarters where our passports and permits were checked at around 8.30am. We were greeted by Gad, the ranger in charge, who gave us the safety briefing and suggested we might like to hire a porter for $15 to carry to carry our rucksacks for us. As we were all carrying 2 litres of water each as insisted upon by the lodge and a packed lunch plus camera equipment, I elected to have a porter. Some of the others didn’t but I think they lived to regret this decision – for me, it was one of the best I’d ever made! Also the money is very much needed by the local people who work as porters do I didn’t begrudge a penny of it. Tough boots with good ankle support are seriously important. Having watched two of the group struggling in trainers, I was very glad I had invested in Brasher boots. A stout stick (provided by Mahogany Springs) was jolly useful for support going down very steep valley track then used for hauling up the other side which was very slippy and ‘impenetrable’! Gators – these I bought for $25 USD from Mahogany Springs the night before as the manager recommended a pair but Gad said on this particular day they wouldn’t be necessary. I tucked my trousers into my thick hiking socks instead. Safari ants are the critters who get up your trouser legs and create uncomfortable havoc so gators or tucking long trousers into thick socks combined with high ankle support boots are a deterrent but not always a guarantee to avoiding this hazard.Another useful item is a pair of thin impermeable gloves (like light gardening gloves) as protection against stinging nettles/thorns etc. This is because when pulling yourself up the steep hillside amongst thick rainforest vegetation, you have to grab whatever is to ‘hand’ and because this has to be done quickly, its not possible to scrutinise to closely what you are grabbing hold of, hence I found it very useful to have the hand protection. Antihistamine cream in case of bites/stings which can quickly swell up and make for problems. Gorillas are immune to stinging nettle so often choose this sort of foliage as a place to rest. Sun tan cream even though in rain forest conditions if you do get the sun this close to the Equator it is very strong. Some money for souvenirs (post trek) as this is a once in a lifetime trip and most people want to purchase a reminder such as a t-shirt or a carved gorilla. There are stall by the park exit and the money does help the local economy massively. The very rare and endangered Mountain Gorilla can be found in the heavily forested and mountainous areas of Central Africa; chiefly the Democratic Republic of Congo, Rwanda and Uganda. They live in the volcanic mountains of Central Africa in protected national parks. In south-west Uganda they can be found in the Bwindi National Park, in Rwanda in the Volcanoes National Park and in the DRC they live in Virunga National Park. The mountain gorilla inhabits the forested slopes of the volcanoes in Central Africa which range in altitude from 7,200–14,100 ft. The volcanoes have created a fantastically lush vegetation which is very dense at the bottom of the mountains, becoming more sparse at higher elevations. It provides the perfect environment for these elusive creatures. The cloud forests where the mountain gorilla lives are often cloudy, misty and cold so they have evolved with thicker fur than their lowland cousins and are classed as a separate sub-species. Although amazingly strong and muscular the mountain gorilla is actually a very gentle and shy animal. They are herbivores and the vast majority of its diet is made up of leaves, shoots and stems, as well as fruit, bark and insects. They need to eat all day long in order to consume enough calories to survive as they are large muscular animals. A male can eat up to as much as 30 kilos in food a day and this is their predominant activity. The other activities they spend a lot of time doing are sleeping and socialising during their lunchtime rest period. These creatures are wonderfully sociable and they live in secure and stable social groups. They show strong bonds between the male and females gorillas and strong attachment to their young. 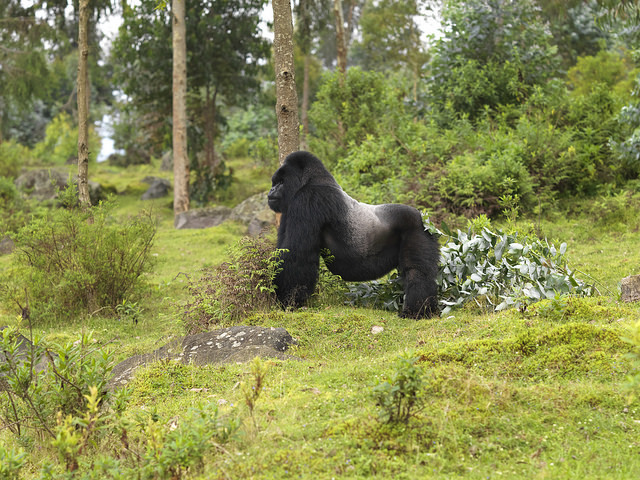 The lead adult male is the silverback who is the dominant male and he will defend his group above all else. He will eventually be challenged by a younger stronger male and retire to the edges of the group or leave for another one. The gorillas are not territorial and move around areas in search of food. The mountain gorilla is one of the most endangered animals on the planet. The mountain gorilla (Gorilla beringei beringei) is listed as endangered on the official IUCN Red List which means that it has suffered more than a 50% reduction in population over the last 3 generations. At the last count in the spring of 2010, the estimated total number of mountain gorillas worldwide was just 790. The gorillas of Central Africa suffer from many threats including loss of habitation due to agriculture and logging, pollution, civil unrest and trafficking for the illegal pet trade. Suprisingly tourism is also fundamental in helping protect this rare species. After land was taken away from local people and turned into protected national parks some kind of recompense was needed to ensure that local people remained in favour of helping the conservation scheme. Limited tourism to visit the gorillas under strict permit schemes has successfully managed to bring a lot of income into the very poor neighbouring areas. In 2008 roughly 20,000 tourists visited the gorilla populations in Rwanda which is turn raised approximately $8 million in revenue for the parks. The other national parks are also benefiting from large tourism revenue streams which cover the park costs and the wildlife authority in charge of protecting the gorillas. The park rangers that guide the tourists also are able to look after the gorillas as they are in closer contact with them, spotting any snare injuries or other health problems. They can also monitor numbers and hopefully divert any potential threats.